1. The first few images you will see is the light background version. I found that having the navy color under the border worked at keeping everything from blending together and washing out. Also lightened up the 3d and shadow on "provisions". 2. Tried a couple alternate locations for the "small batch," and my favorite was within the border on the main face of the label. There is alot going on in this label and blending it into another element helps with clutter. 3. The way you described the font from the first round, I got the impression you are looking for something a bit more "friendly" or "inviting." For the type in these versions I tried to do just that, keep the vintage feel but more fun or rather less serious. The light background version is shown with standard capital case for any body copy but with all caps for headlines and secondary type. The navy background versions show the same and also one with all caps all-around. 4. This version is the version shown in these comps, although like I mentioned in the first bullet, I did have to lighten up this effect for the light background version. 5. To be honest I may have just assumed that triangle was required! But looking at it now it does kind of standout (perhaps that is why they are used in warnings?!) and in a small way has an Illuminati feel? I did make an alternative version you will see in most of these comps with the border altered to match the opposite side, the flame below with some light beams. OTHER: With the space around the lantern logo freed up from the "small batch" eviction I added some light beams. 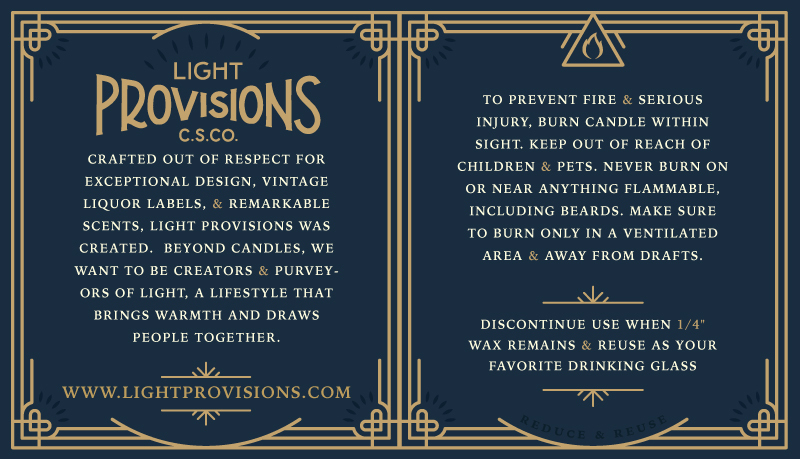 The bottom of the warning panel was starting to feel empty to me so I added "reduce and reuse" in reference to the message encouraging the transformation from candle vessel to drinking vessel.